This tiny gopchang joint is another local favorite though it’s more popular as take-out than eat-in. What makes their gopchang so popular is that they manage to take much of the funky smell out. This is not easy to do with pork. The kitchen does it by grilling the pork entrails over coal briquettes. If you really don’t like the smell of pork entrails, the marinated yangneom gui is the better choice over the salted sogeum gui. There’s a salt seasoning for the sogeum gui to balance out the fattiness and a choice of greens and seasoning to wrap up a delicious gopchang ssam. But most folks do seem to prefer the marinated yangneom gui. It’s surprisingly mild and has a certain addictive sweetness. If you order take-out, double-up on the buchu-muchim, seasoned chives banchan. You’ll need it for the ssam wrap: Take a green and place upon it a piece or two of gopchang with buchu-muchim. 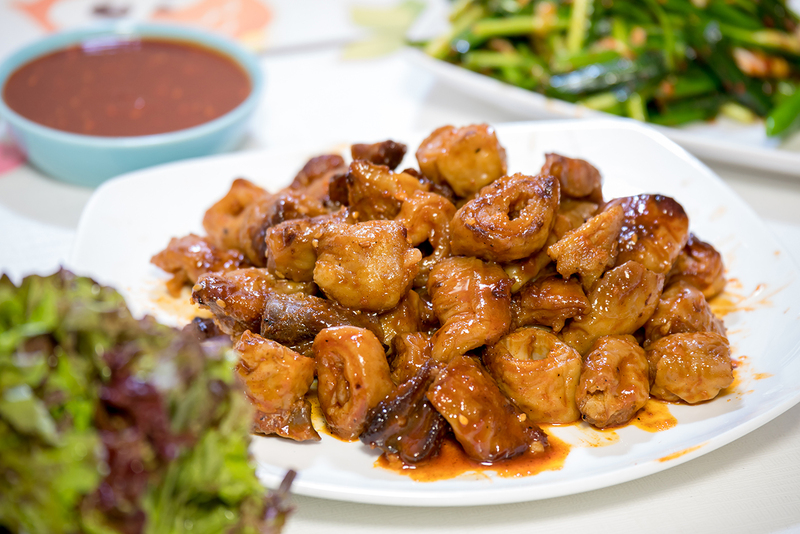 For a challenge, try the makchang or the spicy dakbal, chicken feet. 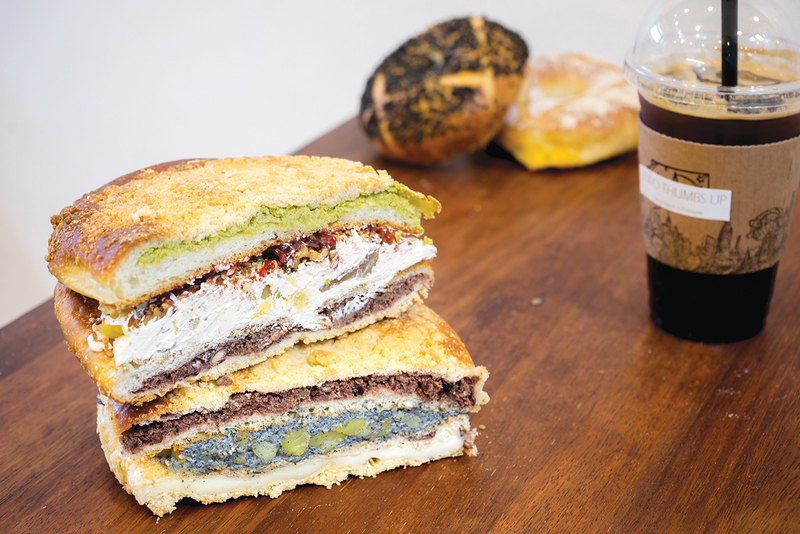 Opened only last year, this Geumho-dong bakery is the love child of a baker-couple who wanted to serve ppang that would please both their customers and themselves. This small, unpretentious bakery has become wildly popular through its breads both savory and sweet. The couple continues to hone their craft by traveling through Europe and abroad. They enjoyed a jambon baguette sandwich in Paris so much so that now they’re serving it in Two Thumbs Up. Other popular items include the garlic bread, smothered in garlic sauce, and a demi-baguette filled with sweet adzuki beans and butter. The signature breads might be their mammoth line. It includes the “Bam-moth” filled with chestnut cream made with chestnuts and other nuts, sweet adzuki bean paste and green pea paste. Their “Heuk-kkiri” features black sesame cream. The owners plans to continue fusing Korean ingredients and flavors into their breads. Check their Instagram feed to find out when particular breads are available. Celebrated restaurateur Chang Jinwoo and graduates from his entrepreneurship school imagined a restaurant where people could enjoy their meals in style and comfort. It was part of their dream to turn Geumho-dong into Geumnidan-gil, a play on the popular dining scene at Gyeongnidan-gil. This playful style is evident in their naming a barbecue restaurant “Flower Service.” The name reflects the owners’ wish to serve the best quality meat with the friendliest service around. The dainty flower-patterned aprons and stools captures this attitude. The two-story restaurant, painted stark white, has large views of the greenery outside. 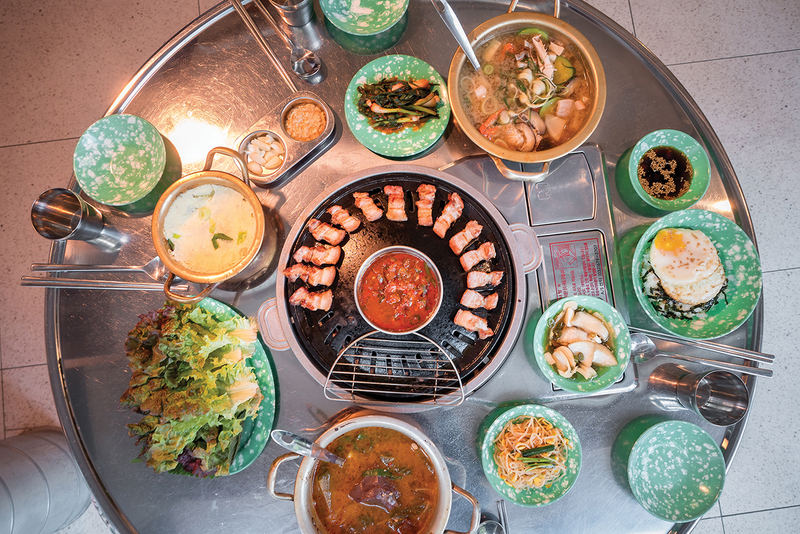 It’s not your usual samgyeopsal joint. The signature menu is the five-layer pork belly from Jeju. The cuts are pre-grilled over charcoal made from oakwood. The barbecued meat is deep and juicy and a little chewy from the grilled pork rinds. A popular dish is the “Flower Egg Rice” that features both hard-boiled and soft-boiled eggs. Also popular is the ham, cheese and ramyeon-filled “Flower Jjigae” that may be the perfect spicy hotpot to round out the meal. 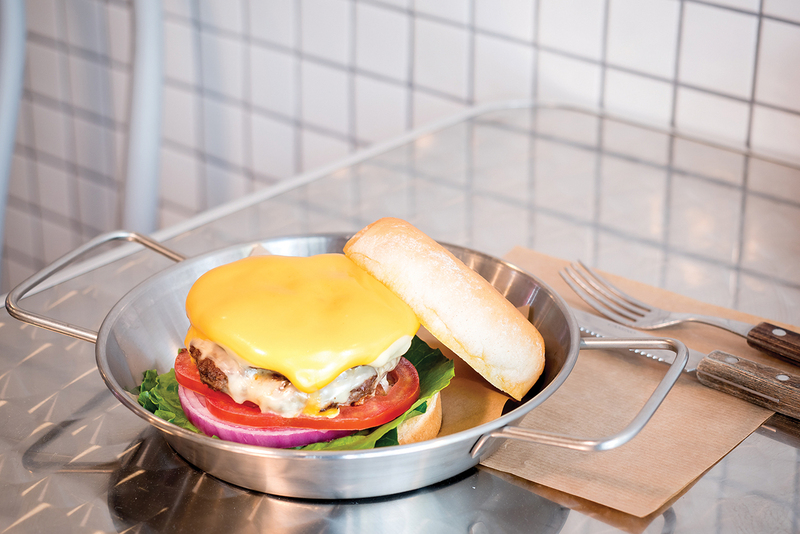 Located at an apartment arcade, this burger shop has quickly become the local insider fix for burger and fries. The street-level shop has about eight small tables and is popular for its stylish minimal decor. The menu features twelve burgers, ranging from from the basic cheese burger to more “complicated” fare like the rose cream rucola burger. You’ll need a knife and fork to make your way through the cream sauce and rucola greens but it will definitely be memorable. Another sloppy choice might be the chili burger. If you like your burger simple, try the double patty cheese burger with the chili fries on the side. Each burger set comes with a small side of coleslaw and chili sauce. The fries are, interestingly, a mix of straight and crinkle fries. The avocado burger with its fan of thin avocado slices topping the patty is a popular Instagram choice, but don’t forget to look past the burgers. In addition to the usual fries (cheese, garlic and chili), onion rings and cheese sticks there are salads, shrimp dishes and even wings available. It’s a smorgasbord of deep-fried heaven.